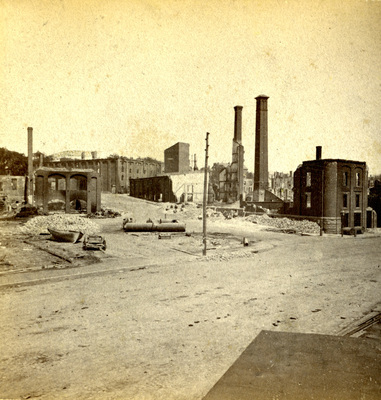 Post-fire ruins of Brown's Sugar Refinery, Maple Street between Commercial Street and York Street, viewed from southwest. "J.B. Brown's Sugar Refinery." (1866). The Great Fire : 1866 - Stereoscopic views. 1. Portland, Me., Great Fire, Portland, Me., 1866, Commercial Street, York Street, Maple Street.